This past weekend I went a little crazy trying to synchronize my iTunes library with the (otherwise totally awesome) Google Music service. As someone who had spent many hours carefully organizing the genres for my iTunes library, I was depressed to see all sorts of wrong and weird genres overriding my own metadata when viewing my library from within Google Music. After a great deal of digging and testing I figured out that the problem has to do with how iTunes encodes (or doesn’t encode) MP3 tags for standard/default genres like ‘Rock’ or ‘Folk’. This may be a painful step if you’ve already spent several days uploading your 100 GB iTunes music collection to the cloud, but it’s a necessary step since (at present time) Google Music will not check iTunes for any metadata changes after a MP3 file has been initially uploaded. To make sure that Google Music accurately reflects the genres you’ve set in iTunes, you can’t use any of the standard/default iTunes genres. These are the autocomplete genres that come pre-installed with iTunes: Alternative, Blues/R&B, Books & Spoken, Children’s Music, Classical, Country, Dance, Easy Listening, Electronic, Folk, Hip Hop/Rap, Holiday, House, Industrial, Jazz, New Age, Pop, Religious, Rock, Soundtrack, Techno, Trance, Unclassifiable, World. Don’t use them. My own methodology included making sure that all of my new genres included hypens, for example ‘Pop-Vintage’ and ‘Classical-Vocal’. 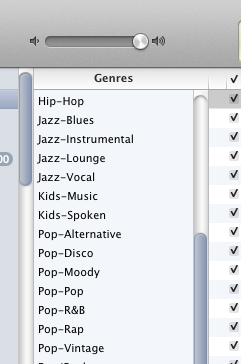 Since none of the iTunes default genres have hypens, I knew I was done re-tagging my music when 100% of genres in the iTunes column browser were hyphenated. With a little luck and these instructions, you should be able to coerce Google Music into reflecting your iTunes genre assignments. Thank you sooooo much!! I have always used Itunes, but recently got an Android phone. I love the music player, but the incorrect genres were driving me crazy. Your solution has solved 99% of my problems….just a few stray tracks which must have other tagging error’s. From a happy music fan!! !